Yes- it's another ridiculous thread about turbocharging! I tried doing some searching, but there is a lot of blank area's that confuse me with this. I have a turbocharged Honda that I built myself and I really wouldn't mind doing the same thing to my '98 Blazer. So first thing's first- how I want it setup.. I believe the term around here is "rear mount?" I assume that it is referring to mounting the turbo on the exhaust somewhere in the rear, not straight off the manifold. I guess to start with my real questions- what kind of power can the stock fuel injectors and pump handle? Are these things that need to be upgraded immediately or could I get away with using the stock fuel system? What kind of power can a 4.3 handle before you need to start throwing internals motor parts at it? I love boost, I especially love turbochargers. I'm just curious what I can get away with slapping a turbo on it with it as-is. My motor is plenty healthy, and i'm rebuilding my transmission soon enough. Hopefully I get some good replies, in the mean-time I will continue with my Google and forum searching. Thanks for reading! Last edited by Prozon; 03-11-2012 at 03:52 AM. 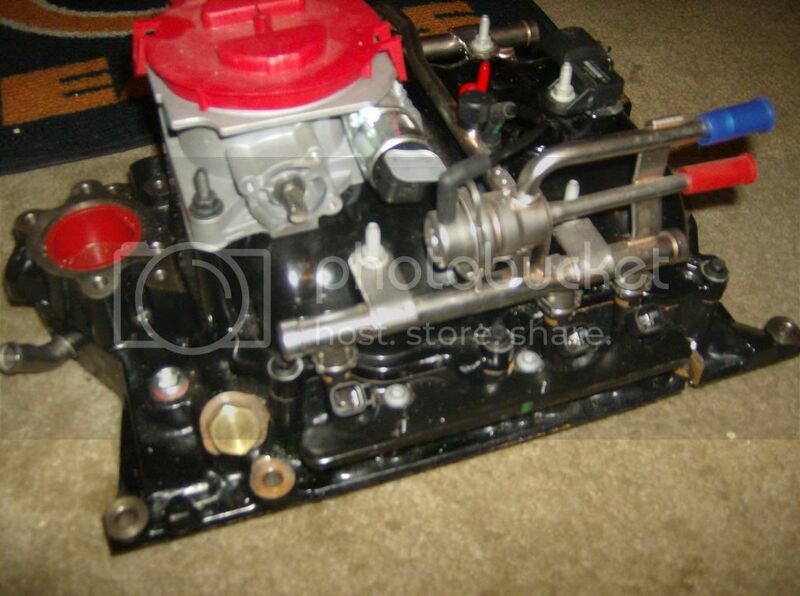 The stock injectors will barely handle the motor its self with no add on's, let alone a turbo. What people usually do is take the intake off the marine 4.3 and put it on their motor, and that will handle everything you throw at it. Internally the 4.3 is pretty solid so unless you have 500k miles on it then i wouldn't worry about anything, and even then i still wouldn't worry. But for the rear mount.. I dont know a whole lot about where to mount turbos but to me i would think the closer you mount the turbo to the engine the better, because you would lose a lot of PSI with the turbo being further away. I DID read about the marine intake but I was not sure what that was referring to. I will at least have something to look into now. As for the rear mount, I think it will work out, it's not so much that you can't build the boost but more so that it will lag more then if it were mounted to the manifold. Last edited by Prozon; 03-11-2012 at 06:32 PM. for the rear mount, I think it will work out, it's not so much that you can build the boost but more so that it will have more lag then if it were mounted to the manifold. Yeah after i said that i remembered some friends talking about rear mounted turbos and the lag that happens. But that was what i was trying to get at. Its my understanding that the lag is the time it takes for the turbo to build up pressure in the pipe running to the engine? Or something close to that. I'm thinking Rotti might weigh in on this.. But this covers most all the bases.. Mo-Power / No Engine lower end changes needed. - by a BF member, concentrates on the Marine intake. It's how I would do it if I were going to. And I've had a few turbo's, too. Actually, from what I know from before.. and what I've learned on here.. if I were going to do engine performance mods, the Marine Intake would be the first step, no matter what! Do away with all the fueling supply issues we see on here. Imagine fuel pumps that last at least 150,000 miles and never worrying about plenum fuel leaks!!!! As it is, though, I prefer going for fuel economy .. where the stock MPFI update setup is about as good as it gets without major tune on the fly. Last edited by pettyfog; 03-11-2012 at 05:36 AM. That is basically it. The lag is just the time it would take to build the pressure up. Another thing to note is that with a tiny tubo, it will generally have less lag then say a big turbo, it will spool quicker, but produce less power. 5psi on a small turbo produces less power then 5psi on a big turbo. Actually, from what I know from before.. and what I've learned on here.. it would be the first engine performance mod I would make, no matter what! As it is, I prefer going for fuel economy .. where the stock MPFI setup is about as good as it gets without major tune on the fly. Thanks for the link Pettyfog. That is an extremely helpful link! I guess I have to go about getting myself a marine intake! Last edited by Prozon; 03-11-2012 at 06:33 PM. That's misleading. Or not true at all, depending on your point of view. I know what you mean but since this is gonna be read for a long time, you either need to qualify it or not say it at all. 5 psi boost @ CFM airflow is 5 psi.. no matter where it came from. Wow, already there is a lot to comment on. Boost is boost & the lag from a rear mounted turbo shouldn't much longer than if the turbo were mounted to exhaust manifold. If it's 6psi at this end of the pipe it'll be 6psi at the other end, just may take a split second for it to catch up. Scott aka UR50SLO Blazer Forum - Chevy Blazer Forums - View Profile: UR50SLO runs a 10psi turbo on his daily driver (DD) with a marine intake etc & hasn't had many or any major issues & still hauls in decent mpg's. Pettyfog has the link posted that I was going to direct you to. A 4.3 is said to have a bottom end that is good for up to 350hp. As was mentioned by a couple people in here you will have to upgrade to a high flow spyder assy like the one from Al at Wynjammer or a marine intake. Personally I like the intake route for real injectors, more ports for temp. sensors etc, fuel rails, medium rise & a bit better air flow. Freeing up the exhaust will be a bonus by allowing the engine to exhale better as well as a cam for obvious reasons. You will not see any mpg gains, lol trust me. Also my experience with the supercharger I installed https://blazerforum.com/forum/nitrou...d-50638/page1/. Don't let it scare you lol, a lot of that was "just my luck" as to how things went but I love it in the end... or when I get to the end of it I should say. Here's a pic of the marine intake I have. Last edited by Rottidog; 03-11-2012 at 11:32 AM. where did you get your intake? The guy I purchased the wynjammer had it. You can google them & probably find lots. It's a marine 4.3L intake for a Mercruiser engine.